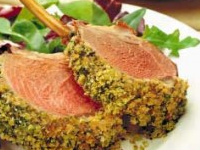 If any meat benefits from the use of fresh herbs, it has to be lamb. You can vary the herbs suggested here and use your favourites. Rack of lamb always looks very impressive on the table but is easy to prepare and serve, which makes it a terrific dinner party main course. This may be a simple recipe, but it’s one that reliably gives a very attractive looking and really delicious result. Preheat oven to 200°C (400°F) Gas Mark 6. Season the lamb with salt and pepper. Place in the preheated oven for ten minutes. Meanwhile make up the topping – combine the herbs, breadcrumbs, seasoning and butter and mix well. After 10 minutes remove the lamb from the oven. Spread the mustard over the top of the lamb. Spoon on the herb and breadcrumb mixture and press well onto the lamb. Place it back in the oven and roast for another 25 minutes. Allow to sit for 5-10 minutes before carving into single cutlets. Delicious served with a baked potato and salad or roasted vegetables – simply toss some chopped peppers, courgettes, tomatoes and red onions in a little olive oil. Season with salt and pepper and roast in the oven at the same time as the lamb.